MVCAN MONTHLY MEETING: JOIN US! Nicole tracks and supports the most effective grassroots groups in California, educates people about the importance of DA and other local races, and comes up with strategies for keeping moderate Democrats’ feet to the fire. Attend the meeting and learn how local races in California battleground districts will help flip Congress in 2018! Saturday, Oct 7, 10:30-12:30 pm - PHONE BANKING IN SAUSALITO. LET’S TAKE A VICTORY LAP! Governor Brown signed the California Values Act Thursday! This Act (SB54) helps to protect members of our California immigrant community from arrest and possible deportation. Kudos to the Immigration Team, and to all of MVCAN and partners for months of dogged work. Marin is the first County in CA to have all municipal electricity accounts powered by 100% renewable greenhouse gas-free electricity! Tiburon, the last Marin municipality to switch to Deep Green, took the plunge last night! We can be very proud of MVCAN’s Eco team, and other members for their work, and a giant thank you to Sarah Loughran and Helene Marsch for pioneering this project county-wide. Last Sunday in Las Vegas was one of the deadliest mass shootings in U.S. history. Republicans in Congress – who have fought for years to block ANY legislation that would protect Americans from gun violence – were quick to offer their “thoughts and prayers” in response. Tell Republicans in Congress: “Thoughts and prayers are not enough!” Republicans must put the safety and welfare of their constituents first, before the National Rifle Association. We need gun control now. Click here to sign the petition. CREDO now has more 300,000 signatures on the gun control petition, and along with many additional coalition partners, will deliver a powerful message to the Congress this week. PHONE BANK FOR IMPORTANT STATE ELECTIONS - Saturday! Our next target is winning the November 7, 2017 state-level elections in Virginia and Washington. We need to win back state legislatures and governorships so we can regain control of big issues like voting rights, gerrymandering, a woman's right to chose, and yes, gun regulation. Our experienced phone/text bank leaders will be on hand to coach you and train you. Every Saturday until November 7th! Contrary to any “fake news” obituaries you may have read, Single Payer Health Care legislation in California is far from dead! Come and learn how to truly make healthcare affordable for all! Peter Arno has co-authored a comprehensive economic analysis of proposed single-payer healthcare in California. He is an authority on the potential savings from lowered costs of care and the payments in taxes and health insurance premiums that can trade off to lower costs to individuals and small businesses. GET YOUR TICKETS FOR THE MVCAN ANNIVERSARY PARTY! COME CELEBRATE ONE WHOLE YEAR OF MVCAN COMMUNITY ACTION! YOU’VE ALL DONE TRULY AMAZING WORK! Join us for an evening of music, art and storytelling. 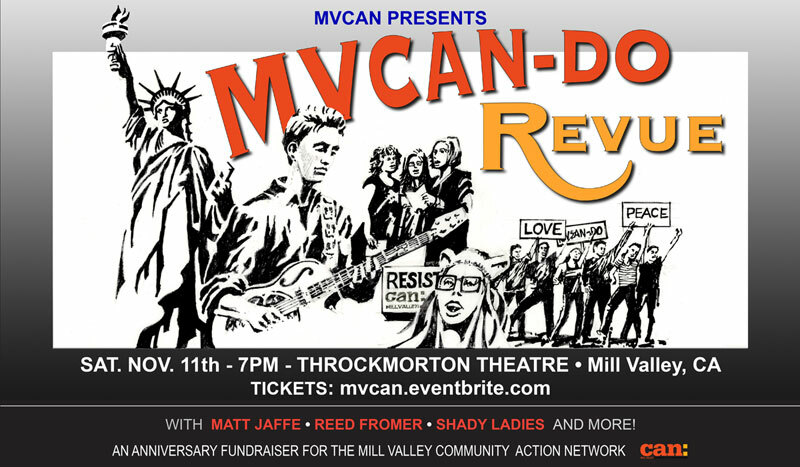 The MVCAN-Do Revue will feature community members and local performers including Matt Jaffe, Reed Fromer, the Shady Ladies and many more! Get your tickets now for our first fundraiser while they’re still available! The Marin Rapid Response is up and running! Join us Saturday, October 5, 11:00 am, West County Detention Center, 5555 Giant Hwy, Richmond. Next Civil Rights/Immigration Team Meeting: Wednesday, October 18, 7:00 pm, Diane Goldman's home. E-mail her at dgold94941@aol.com for directions. Planning gets underway for our event “Beach Party 2030.” In the face of drastic climate change and rising sea levels, we will be projecting forward in time to find out where our beaches will be in 2030. Join Eco Team's first planning meeting & BBQ happening this Friday, Oct 6, 6:00 PM at the scenic Alpine Lodge in Mill Valley. Come an hour early at 5:00 to join us for a hike. Share ideas and find out how you'd like to be involved as we get the beach ball rolling! Click here for details. The team leaders came together to address the issues that affect all of the action teams. To improve communication, we are working on tying together the weekly WAG, the Facebook page, our website, and individual team pages. We also put in place new and improved action plans for lobbying our elected representatives in order to more effectively influence elected officials from the local to the national level. The Economic Action team has launched AIRLIFT, our first national project. AIRLIFT funnels money to grass roots groups in winnable 2018 districts. These are seriously vetted organizations that work all year round in their communities, groups that get tangible results without blowing through millions of dollars. Read about it in the Huffington Post.